I am a practicing herbalist of over twenty years. In practicing herbalism, I had become frustrated with having to cross-reference multiple resources in order to gather all of the necessary information on any one herb or disorder. It was time consuming and easily forgotten once the reason for the research had passed. 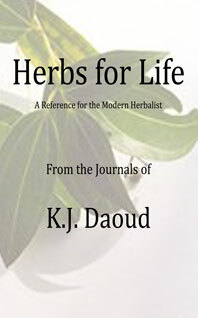 Herbs for Life, which began fifteen years ago as my personal journal, takes all of this information from its various locations (books, nutritionists, herbalists, articles) and compiles it into a comprehensive and easy to follow book so that practitioners have everything they need in one location, formatted in a way that requires no extra research or legwork. I learned herbalism from other herbalists and nutritionalists, books, and most anything I could lay my hands on. I have used this information to conduct panels and speeches at conventions, and to teach students interested in herbalism. I currently provide panels, lectures, and workshops on medicinal herbalsm, essential oils, and other folklore uses of herbs. I hope you enjoy my efforts.